The Lockn’ Festival 2016 initial lineup is here, and with it brings unprecedented headliners including Phish, My Morning Jacket, and Ween. In September of 2013, Arrington, Virginia opened the grounds at Oak Ridge Estate to what would immediately become one of the summer’s premiere music and camping festivals, with an estimated 25,000 tickets sold in its first year. The upcoming 2016 festival weekend has changed from post-Labor Day weekend to late August (8/25-8/28), a change which founders David Frey and Peter Shapiro have stated was due to many being unable to attend the mid-September date. Further big lineup announcements are expected in the near future, but for now there’s more than enough to be excited about. Phish will headline Friday night directly following Ween, another Lockn’ first timer who recently reunited in Colorado with three sold out shows. The Grammy-nominated My Morning Jacket will headline Saturday night, a big headliner for the bill, and the adored Joe Russo’s Almost Dead will perform two nights. 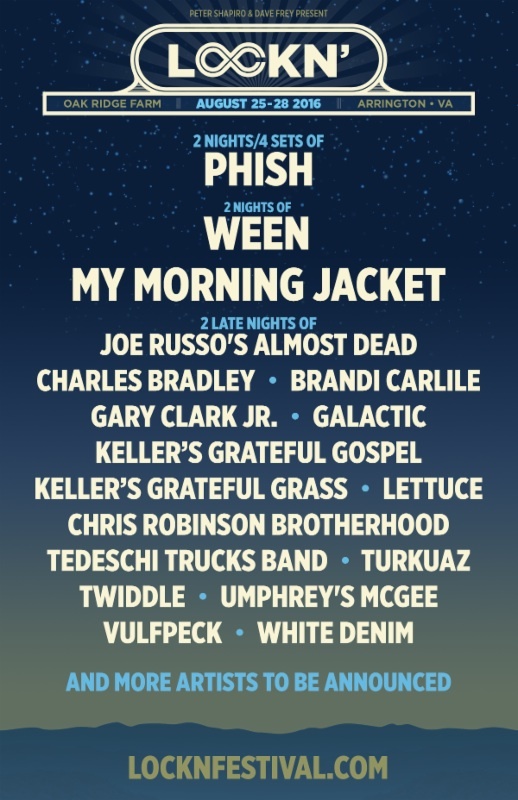 Lockn’ 2016 will also welcome festival veterans including Keller Williams’ Grateful Gospel and Grateful Grass, Gary Clark, Jr., Chris Robinson, Umphrey’s McGee, and the beloved Tedeschi Trucks Band. General Admission and VIP tickets for Lockn’ 2016 will go on sale this Friday, February 19 at 12 noon ET on the Lockn’ website, as will on-site camping, RV and hotel and shuttle packages.